To find the Generate Playlist dialog box click the icon on the toolbar. Replace Existing Playlist option: Replaces the existing playlist with the generated playlist. Insert at Beginning of Existing Playlist option: Inserts the generated playlist at the beginning of the existing playlist. Add to End of Existing Playlist option: Adds the playlist to the end of the existing playlist. Clear History option: Clears the History List after generating the playlist. Auto Play After Generate option: Causes OtsAV to begin playing after the playlist is generated. Advanced Mode: Enables the advanced user access to the Playlist Generation Template text input area. By default this text area is disabled. This text area displays a playlist template. If advanced mode is enabled, the playlist template can be directly entered or edited. Clear button: Clears the current playlist template. Load... button: Enables you to find and load a playlist template, .otm file. Save As... button: Enables you to save a playlist template as an .otm file. 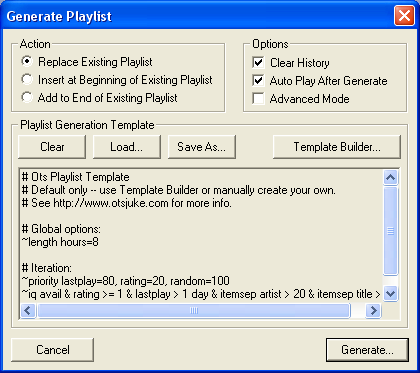 Template Builder button: Opens the Playlist Template Builder dialog box. Generate button: Generates a playlist based on the template.